This is a narrative describing Suffolk County Air Force Base when it was a prime Air Defense Command (ADC) installation in the northeast. My comments are based on personal memories of a young man who lived in nearby Remsenburg in the 1950s and later, as an Air Force officer from 1969 to 1972. I was never stationed at Suffolk, but saw many annual air shows and visited the base before it closed in December, 1969. Several Air Force historians and airmen who were stationed there contributed to this work, including Colonel Jon Myer, who flew the F101B from Suffolk in the early 1960s. I have found no definitive history on Suffolk County AFB so far. However, it was established during WW II as a U. S. Army Air Corps base and gunnery range. Unlike its Long Island neighbors situated closer to New York City, like Mitchel Air Force Base, it had more space, longer runways, less crowded air space and room to expand. In the early 1950s, it became the prime Air Defense Command base responsible for defending the New York metropolitan area against hostile air attack. In the 1950s, there was a real threat from the Soviet Union. ADC had three prime missions: radar surveillance (a radar squadron operated from Montauk Air Force Site [AFS] ); bomber interception by fighter interceptors and ground-to-air missile operations. I recall much of the bases expansion at that time. Every year, new buildings were erected including the imposing ADC alert hangars. New housing went up west of the airfield in 1957, as well as many support buildings like the Commissary, Dispensary, Exchange and Non-Commissioned Officers Club (NCO) (Fabulous Rocker). Many airmen lived in nearby communities, including Riverhead, Quogue and Westhampton. Suffolk County AFB's mission was bomber interception, and for a brief period, BOMARC air defense missile operations. It hosted the F86D from 1955 to 1957, the F102A from 1957 to 1959 and, finally, the F101B from 1959 to 1969. I found a photo of an F94 assigned to the 2nd Fighter Interceptor Squadron (FIS), but am not sure if it operated from Suffolk. In 1959, former Suffolk F102As were transferred to U. S. Air Force Europe (USAFE) bases in Germany and the Netherlands. The Suffolk based 2nd FIS Squadron was one of the first ADC units to receive the F101B. The 98th FIS moved to Suffolk from Dover, DE, in the summer of 1963. It was always exciting driving past the base. In the late 1950s, only the military was flying supersonic jet aircraft like the all-weather capable F102A Delta Dagger or "One-O-Wonderful" F101B Voodoo. The nicknames were usually applied to the air and ground crews, using the "Voodoo" theme: "One-Oh-Wonder" for the pilots, "Scope Wizard" for the Radar Intercept Officers (RIOs, later called Weapon System Officers/WSOs or "Whizzos), and "Witch Doctors" for the maintenance guys. They were a formidable sight, whether taxiing past the alert hangars or taking off in formation. Great air shows. The first was in the late 1950s. The base operated the F102A then, but there was a variety of Military Air Transport Service (MATS) transport and Strategic Air Command (SAC) aircraft on display, including a KC97 and new KC135 tanker. My father (a WWII Air Corps vet) had a nice chat with the KC97 pilot on the tanker's evolution from the B29. The second great air show occurred on Labor Day, 1965, when Colonel Francis Gabreski was the 52nd Wing Commander. 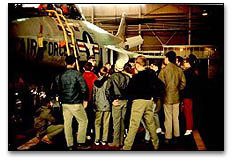 He was signing autographs under the nose of an F101B. Gabreski is one of the U. S.'s top aces from both WWII and Korea. The Thunderbirds put on a splendid show with F100s. One did a barrel roll low over the field. I have not seen this in any of their performances since. They also were giving rides in a Ford Trimotor. The F101B was big (longer than a DC3) and its powerful twin J57 turbojet engines made a unique sound during takeoffs and landings. From Remsenburg could always hear them taking off on afterburners. One day I was at a gas station about a mile west of the runway when one came over at less than 1000 feet. The attendant (who must have been in a daze) almost jumped out of his socks! Voodoo formations often came in low, over Tiana Beach and woke up lots of sunbathers. The F-101B/F was 70 ft., 11 in. long; the F-102 "Dagger" and F-106 "Dart" were also about 70 ft. long. The "unique sound during takeoffs" was the double-afterburner "boom-boom" from each bird as the tailpipes were "set on fire"
Air Defense Command was a key component in the Air Force structure in the 1950s and early 1960s and Suffolk's 52nd Fighter Interceptor Group (FIG) and Wing played an important role. From an organizational standpoint, ADC squadrons usually operated as self sustained units on bases controlled by other commands, like SAC. There were exceptions where ADC operated the base and a Fighter Wing (FW) with two squadrons; the 78th Fighter Wing at Hamilton AFB, California and the 52nd at Suffolk. The 52nd FW was comprised of the 2nd and 98th Fighter Interceptor Squadrons, from 1963 to 1968. Col. Gabreski was the commander from 1964 to 1967. The 2nd FIS "Horny Horses" were in residence during the entire period when Suffolk was an ADC base, from August 1955 to September 1969. The 5th FIS was active from August 1955 to February 1960 and the 98th was at Suffolk from July 1963 to September 1968. From September 1968 until the base closed in 1969, the 52nd was again reduced to a group level organization (52nd FIG). After Suffolk closed, the 2nd FIS operated F106A/B at Wurtsmith AFB from 1971 to 1973. 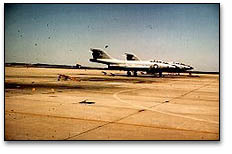 The squadron came back a third time at Tyndall AFB Panama City, Florida in 1974 as the 2nd Fighter Intercepter Training Squadron (FITS); the F101 and F106 training squadron. It was redesignated in 1983 as a Tactical Fighter Training Squadron under the 325th FW; AETC flying F15 RTUs. The 98th FIS never returned to active duty after it was inactivated at Suffolk, on September 30, 1968. The 52 FW was inactive until 1971, when it relocated to Spangdahlem AB, Germany, It now operates F16, F15 and A10s that were in the "Allied Force" in Kosovo. Their web site notes only the "modern era" starting in 1971, so I am not sure if any detail on its assignment to ADC exists. During the Kosovo air war, when President Clinton was at Span gdahlem, he spoke under the 52nd emblem (Seek, Attack, Destroy), which is identical to its display on Suffolk interceptors. ADC downsized rapidly in the late 1960s, when the threat and mission changed from manned bomber to missile attack and requirements for the Vietnam War. Many former ADC pilots became close air support drivers and Forward Air Controllers (FAC) in Vietnam. By 1968, I had visited several bases, like Eglin, Wright-Patterson and was assigned to Plattsburgh for AFROTC field training. Suffolkís facilities seemed more temporary than the others did. This was due to ADC receiving less funding than SAC, Tactical Air Command (TAC) or overseas commands. In his autobiography, Col. Gabreski said that when he reported to Suffolk in 1964, "I found the base quite a shock. The equipment - the 52nd was flying F101B Voodoos at the time - was great, the people were great, but the facilities were meager". Jon Myer, a former Suffolk F101 pilot said that the 98thís squadron building was a converted missile maintenance building requiring much "self-help" to make it serviceable. The 2ndís operations building wasnít bad at all, as they had inherited the "permanent" facilities of the departed F-102s (Deuces). I was at Sheppard AFB, in September 1969, when I read in the "Air Force Times" about Suffolk's closure. Shortly after reporting to McGuire AFB I drove to Long Island and visited the base on December 1, 1969. 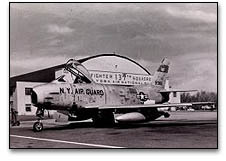 The F101Bs had transferred to the Maine Air National Guard (ANG) and other operations were winding down rapidly. The base theater, called "Broadway East", had a sign saying the final performance was to be presented on December 7th. I stopped at the Visiting Officers Quarters (VOQ) and a bored attendant said there were no rooms available. Six months later, it was deserted, except for the New York Air National Guard (NYANG) who were flying C97s. Incidentally, the 132nd FIS of the Maine Air National Guard (ANG) at Bangor (called "Maniacs") flew Voodoos from 1969 until 1976. Many former Suffolk "birds" went to the boneyard, after 1976. F101s were not used as drones, like the F102 or F106, as they had more difficult handling qualities and a tendency to "pitch up". Jon Myer said that this "tendency" was due to the birdís design with a high "T" tail (like many airliners today, in fact), but the "pitch-up" itself was usually pilot-induced. If the pilot pulled back on the stick too much for the speed (i.e. exceeded safe angle-of-attack limits or g-forces for the airspeed), the wing surface could blank out the air flowing over the elevator surfaces and render them useless for control. The "pitch-up" that then ensued rendered the aircraft uncontrollable unless corrective action was taken: relax back pressure on the stick (positively move it forward to neutral position or beyond) while pulling the throttles out of burner (if they were in after burner [A/B]) and deploying the drag chute to help realign the aircraft into its relative airflow. Done correctly, the aircraft would maintain a nose-low attitude, though it might snap roll (if one wing resumed "flying" before the other). However, it would become controllable again as the airspeed built back up (from near zero). The drag chute would fail at approximately 250 knots. The pilot was advised to attain 350 knots (to be sure controllability was restored) before attempting any maneuvers except to fly home carefully and, of course, try to avoid a no-drag chute landing. There were three warning systems aboard the aircraft to prevent or warn against pitch-up: the autopilot's control stick limiter (CSL, if auto pilot (A/P) was engaged, which required 60 lbs. of force to override); a warning horn half a "g" later; and a 28 lb. control stick "pusher" a bit after that (though we turned that off for low-level flight as it, too, could malfunction). However, a ham-handed pilot, especially if a bit rough on the rudders while horsing back the stick, could pitch up despite all of these cautionary measures. One crew did exactly that: they lost the plane in the ocean, however, both crewmen got out okay and were picked up by a U. S. submarine. All in all, during its era, the F-101B/F was the best of the Century Series Interceptors, despite its limitations (pitch-up risk, not as fast as the F-106, not as maneuverable as the Deltas, and higher fuel consumption in max A/B). Its combination of relative reliability, two-man crew, then-unrivalled acceleration and electronic counter-countermeasures (ECCM) features all made it the "bird to commit" when the intercept was tough, i.e. in night/weather/Electronic Counter Measures (ECM) conditions. After a couple of Interceptor Improvement Program (IIP) mod packages were retrofitted in 1964-65, all three interceptor types had a tunable magnetron (against slow tuning noise jammers) and an infrared search and track subsystem (IRSTS). This was most useful at low altitude when radar returns were obscured in ground clutter or if ECM obscured the target at higher altitudes. The F101 and F106 got added anti-chaff features and an exceptionally fast-tuning magnetron installed, which helped avoid (or "burn through") most noise jammers in their frequency band. After the Air Force closed the base, it was turned over to Suffolk County. The New York Air National Guard (106th Group), then flying C97 cargo aircraft, took over the ADC alert portion of the field. The remainder of the airfield was eventually used by general aviation. The NYANG history notes that the 106th Group relocated from Floyd Bennett Field to Suffolk Airport in 1970. Their website does not have much detail on when Suffolk was an active base. However, after their C97s were retired, the 102 FIS operated the F102A from 1972 to 1975. Thus, for the three-year period, Suffolk again assumed its air defense mission. The current rescue mission started in 1975. Currently, the 106th Rescue Wing, composed of NYANG's HC130s and HH60G Pave Hawks, operate from part of the former ADC base. This unit gained fame in a recent best selling book, "The Perfect Storm", in which one of their Pave Hawks was involved in a dramatic rescue in high seas. A Discovery Channel "Air Wings" program on pararescue men or "PJs" features interviews with several of the 106th aircrew who were involved in the "Perfect Storm" rescue. The remainder of the field is used for general aviation and was renamed Francis Gabreski Suffolk County Airport, several years ago. Many former Air Force buildings, not used by the NYANG or general aviation, have only recently been torn down. The Coast Guard uses some of the remaining base housing.